COLUMBUS, Ohio – The Ohio State women’s soccer team continues its non-conference slate this weekend at No. 5 Florida and at home against Duquesne. The matchup against the Gators is set for 7 p.m. Friday in Gainesville before the Buckeyes open their home schedule against the Dukes at 7 p.m. Sunday. Fans can follow live stats and streaming video on the schedule page at OhioStateBuckeyes.com or follow on Twitter @OhioStateWSOC. The Buckeyes suffered a pair of 2-0 defeats on the opening weekend at No. 3 Duke Thursday and No. 6 North Carolina Sunday. 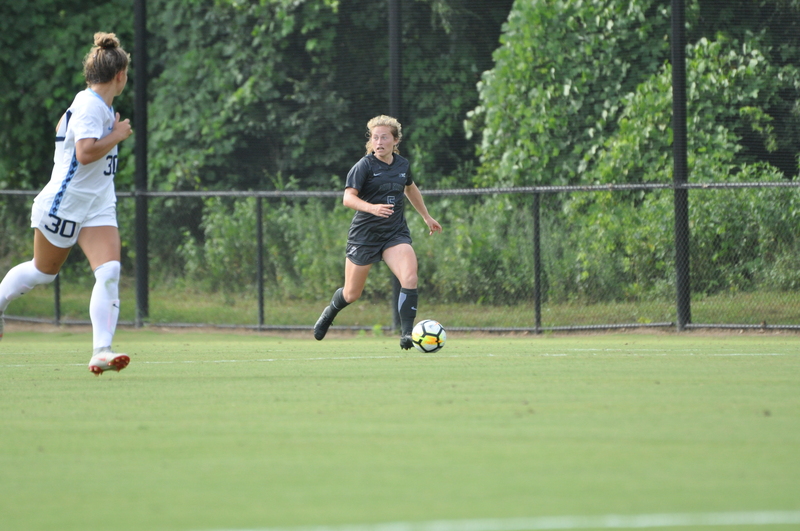 The Blue Devils scored a pair of second-half goals in the opener while the Tar Heels notched a free-kick goal in the 37th minute and another in the 58th. Devon Kerr tallied eight saves against North Carolina after stopping five shots in the opener at Duke. Ohio State was selected second in the Big Ten preseason coaches’ poll, the conference office announced Aug. 13. The Buckeyes, who were picked behind only Penn State and ahead of Rutgers, Northwestern and Wisconsin, also had seniors Arden Holden and Sarah Roberts and sophomore Izzy Rodriguez named players to watch. – Ohio State is 37-1-2 when scoring at least two goals in a game since the start of 2014, including 11-0-0 a season ago. The Buckeyes went 5-0-1 when scoring at least twice in 2014 before going a perfect 11-0-0 in 2015 and 10-1-1 in 2016. – Ohio State went 15-1-0 when scoring first last season after going 10-0-1 when scoring first in 2016. – Ohio State was 4-1-1 in overtime contests in 2017 and 9-2-7 in overtime matches over the last three seasons. – Devon Kerr’s nine shutouts last season tied her with Emily Haynam and Amber Barnes for second on the Buckeyes’ single-season shutout list. Kerr also sits tied with Katie Baumgardner for fifth on the Ohio State career clean sheet list with 11. – Kerr ranks 24th nationally and tops in the Big Ten with 13 saves. The Gators are 2-0 on the year, picking up a 2-1 win over Washington in their opener last Friday before a 4-2 Sunday win over Florida Atlantic. Sammie Betters and Madison Alexander have scored two goals apiece while Cassidy Lindley and Sarah Troccoli each have three assists. Kaylan Marckese (1.00 GAA) and Susi Espinoza (2.00 GAA) have split time in goal. The Buckeyes have won the only matchup against the Gators, a 1-0 overtime victory in Columbus in 2015. Duquesne is 0-2 on the year after suffering a 1-0 loss to Arkansas and a 6-0 defeat at No. 4 Penn State on the opening weekend. Casey Aunkst leads the Dukes with two shots while Kyra Murphy has tallied a 3.50 goals-against average. Ohio State won the only previous matchup against Duquesne, a 3-0 triumph in Columbus in 2012. Ohio State hosts Morehead State at 7 p.m. Aug. 30 before traveling to Notre Dame for a 1 p.m. matchup Sept. 2.